Canyon of the Ancients National Monument, April 5, 2005. 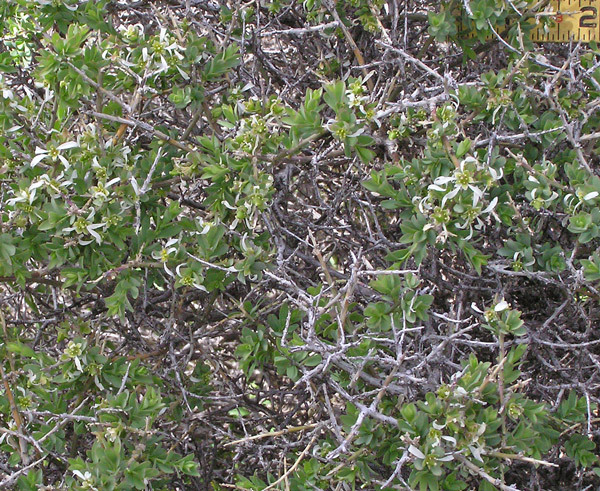 This is an unusual, uncommon, spiny shrub found in most western states but most often in scattered or rare populations. 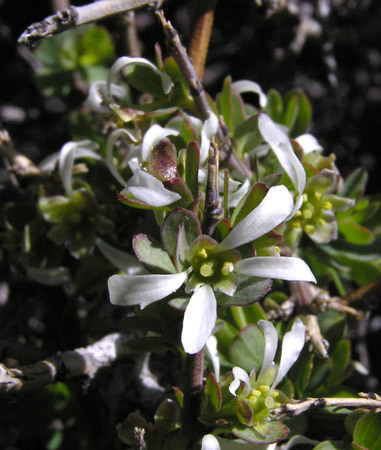 The narrow petals of its white flowers (not green as stated in Weber) twist and curl and some petals fall considerably before others, giving the plant an unkempt appearance. As you can see in the photograph, branches lose leaves and eventually become sharply pointed -- giving rise to the specific epithet "spinescens". Asa Gray named this plant Glossopetalon spinescens in 1853 from a specimen collected by Charles Wright "in a mountain ravine near Frontera, New Mexico [now Texas]" in 1852. [Intermountain Flora quotation.] Edward Greene renamed it Forsellesia spinescens in 1893. Weber's Colorado Flora 2012 now accepts Glossopetalon spinescens. "Meio" and "nandra" are both from the Greek for "less" and "dwarf", perhaps referring to the relatively low growth form of this shrub. Typically Glossopetalon spinescens is 2-3 feet tall in the Four Corners region. "Glosso" is Greek for tongue and "Glossopetalon" refers to the narrow, tongue-like flower petals. "Forsellesia" is for Jacob H. Forselles, a 19th century Swedish mining engineer. Canyon of the Ancients National Monument, May 11, 2011. 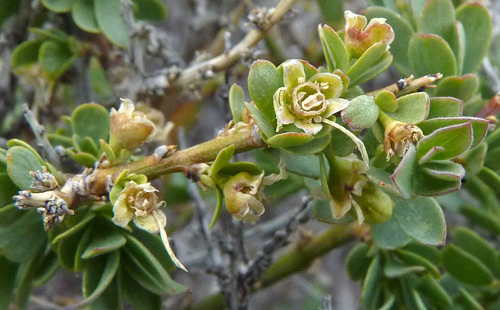 In this photograph, all but a few dried strands of the petals have fallen and the buff colored sepals and base of the flowers surround the developing seeds. Notice also the white outline of the leaves, especially evident in the central-right portion of the photograph. The leaves are clothed in fine white hairs.